Wondering how to make a Slack bot that drives thousands in revenue? In this tutorial, you’ll find how we built a profitable Slack bot Standuply (a bot that runs asynchronous standup meetings via text, voice/video and tracks team performance). I talk about our ups and downs building and promoting a Slack bot from zero to 650 customers. Marketing channels used: Slack Bot Directory, Content Marketing, Product Hunt, Social Networks, Startup Conferences. Being bootstrapped we were able to reach $25,000 in monthly revenue becoming profitable. Pricing strategy used: started as a free in beta then rolling prices, plans and restrictions smoothly step by step. But in contrast, we had a hell of motivation like there was no 2nd chance. So, after two years of hard work, stress, and fear, we made our first step towards success. In May 2018, Standuply reached $25,000 in revenue. It means we’re profitable 🎉 Standuply now serves 650 customers from Slack, Evernote, Adobe, IBM, SAP, GE and other great companies. And, it’s just a beginning. We’re adding $3–5k in MRR each month looking to hit $100k in 2019. 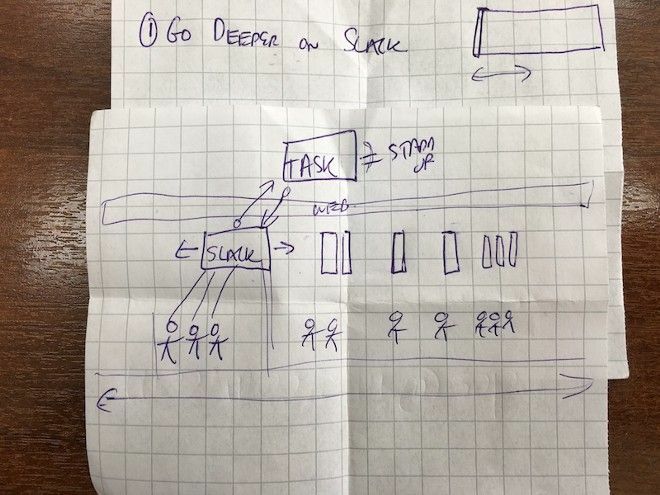 It all proves that $1M business can be built entirely on top of Slack. Reaching profitability was damn hard. But now we have time and learnings to share. Presenting to you, the Slack Bot Business Tutorial. Our team was building MVP and experimenting with Slack bot API in 2016. We changed the concept three times, and at some point, we were almost ready to give up. Later, we were lucky to find focus and launched Standuply in December of 2016. It’s a long story to put it here. I wrote a dedicated blog post about the very beginning of our journey: From Business Idea to $100k Product Launch. At the beginning of 2017, we had a beta that was serving about 200 teams. However, it was far from being perfect in regards to features and stability. Back in the days our website didn’t work properly in Safari, and Standuply lacked a few features our users were constantly asking for. Some teams were leaving due to that. It was painful, but we couldn’t do much with two developers on the team. It’s the price you pay when bootstrapping. One of the popular feature requests was about adding answers if a user missed reporting in time (i.e., when Standuply runs standup meetings). Then Slack announced buttons for their bots. It would allow easily adding answers in Slack. Buttons seemed like a great addition to the functionality of our Slackbot. However, our tech infrastructure wasn’t ready for that. Guess what? We decided to re-write the bot entirely to deliver that additional feature. Ouch! Don’t do this at home! After the release, that feature of adding answers didn’t become any popular. We’d better off spending time on core things like integrations or improved stability. This is how we learned additional features are not that important compared to core features. No matter how many nice tiny things you build, product’s success is about core features people buy in. No matter how many nice tiny things you build, product’s success is about core features people buy in. After all, it took us the whole 2017 year to go from unstable Slack bot with a crappy web interface to a working product with a nice web app. Everything takes time, especially in SaaS. So, we learned valuable lessons. I go deeper into details about those learnings in a dedicated blog post. Read it here. We leveraged several marketing channels to speed up our growth. Here are the major ones that drove us traffic and (sometimes) leads. 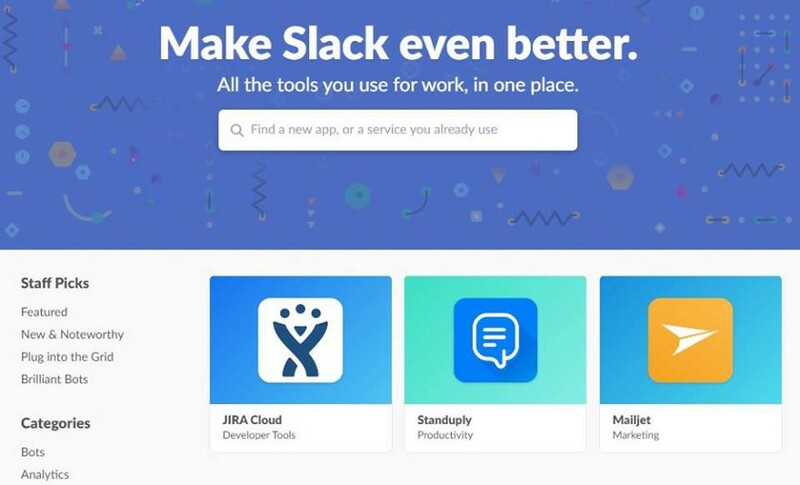 Someone at Slack decided that our Slackbot is worthy and Standuply had been featured on the main page of Slack Bot Directory in March 2017. 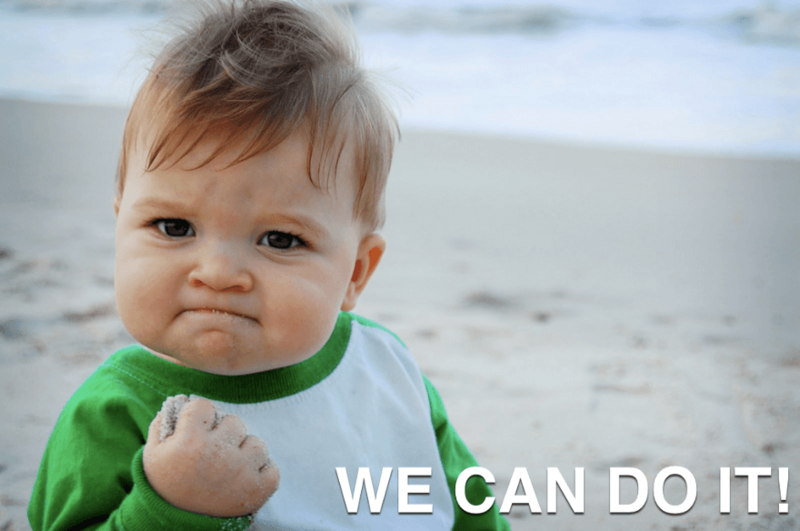 In two weeks we got 750 new signups and reached a milestone of 1000 teams. Even after featuring was over we’re still getting a steady stream of new users from Slack. Being listed in Slack Bot Directory is the #1 driving factor for an early stage Slack bot. See the graph before and after the featuring. Wow! I put out several long reads. 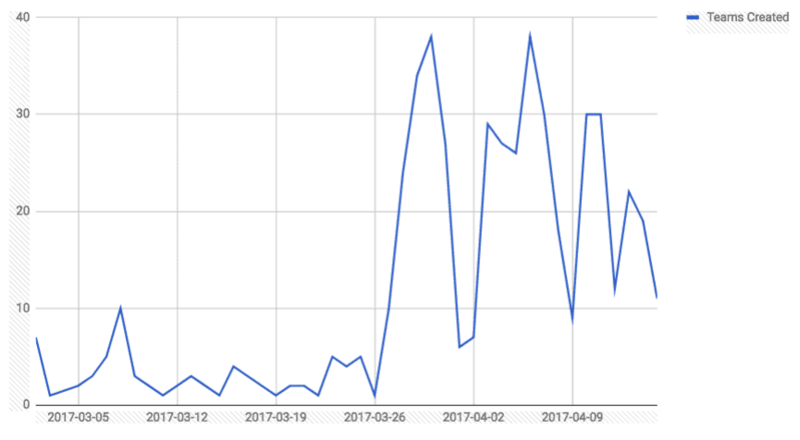 It helped us to improve our SEO and led decent traffic to our blog on Medium. Overall, my posts received 150k views in 2017. Special thanks goes to Brian Dean of Backlinko for great on-page SEO tips that helped us in getting traffic. The result, though, was far from what we expected. Very few of new signups came from those posts. People were reading and passing by. As a company, you can’t create a story with unique visual identity on Medium. Also, there are fewer ways to convert readers into subscribers (like Sumo.com that we’re using for WordPress). So we decided to switch to WordPress. Later I’ll share our content marketing failures and learnings on this blog. Meanwhile, you can check out a very detailed guide by Nichole Elizabeth DeMeré how to approach content marketing from scratch: Startup Founders, This is How to Do Content Marketing from Day 1. We used Product Hunt Ship to launch Standuply and related Slack bot products 8 times in the latest 18 months. We love Product Hunt and what about you? The first it was our initial launch that brought in our very first users. It wasn’t that successful as we ended up on 7th place. However, it brought us 150 teams. The second time it was a web-page of our popular blog post with 1000 Slack groups. It became the 2nd product of the day, brought us ~5k visits, and … a couple of new sign-ups. 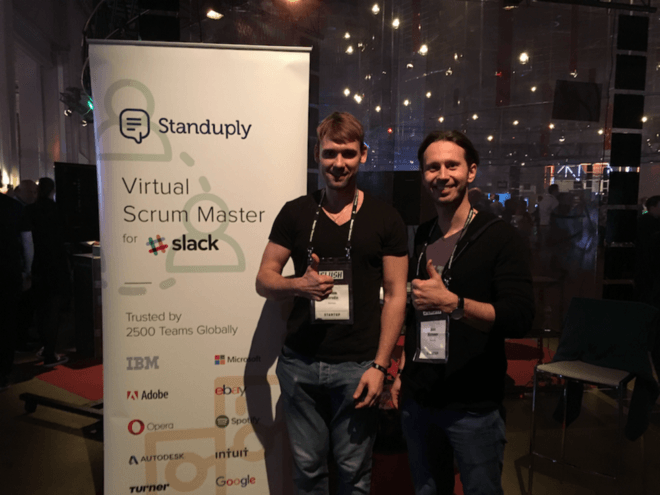 The next time we shipped Standuply 2.0 when the product matured enough. We got some traction: 6th place of the day, mention in Product Hunt’s email list, and about 100 new teams. In the meantime, we shipped our major features with various results: Top Daily Hunts in Slack (#5 product of the day), Slack Video Messaging (#2 product of the day), Slack Voice Messaging (#3 product of the day). Our best launch was the latest one — Standuply 3.0. It became #1 product of the day and #4 product of the week. So we made it to both Product Hunt email lists, daily and weekly. See how it affected on our registrations. Here is what we learned about launching on Product Hunt. 1. You can ship features and major releases as many times as they are deployed. Product releases tend to attract more attention and bring more registrations. 2. It’s the matter of luck with whom you compete on a launch day. Tuesday and Wednesday are the tough days. If you’re not 100% sure — go for Monday. 3. The overall result is about how appealing the product and how many external supporters you bring. 4. Usually, #1 product from Mon to Thu makes it to the Weekly Newsletter, while #1 product from Fri misses that. It’s the matter of luck with whom you compete on Product Hunt on a launch day. If you’re not 100% sure — go for Monday. In all, it brought us ~20k visits in the last 18 months. I hope we’ll learn how to leverage the social network effect in the future. If you know good tricks or well-written guides, please let me know in the comments below. We had a booth at three conferences in 2017— ChatBot Summit in Berlin, Slush in Helsinki and TechCrunch Disrupt in Berlin. Chatbot Summit was a total failure — zero potential customers and worthless talks how chatbots will rule the world (I admit — most of them won’t). Slush — was a great event, more like a party. We enjoyed it a lot. Also, Slush provides an ability to book coach sessions with speakers. We talked to Des Traynor from Intercom (which we’re using daily for customer support). His strategic advice to us was to stick with Slack and do some tactical moves. Thanks, Des. — name your important customers; who are using your product and why? TechCrunch Disrupt in Berlin can’t compare to the same event in SF. It was also a failure. Few relevant talks and potential customers; startup alley wasn’t worth its price. As a result, we had at maximum the same amount of signups from the three conferences as on a regular day with zero marketing budget. However, seeing how people react to a message on our roll-up is priceless. We even asked encounters to explain what do we do just by looking at the roll-up. That was insightful. Eventually, we decided that startup events aren’t worth our time and money at the current stage. You know, it takes a lot to travel from Siberia. All of the activities above generated some buzz, and so we ended up with 15,000 teams signed up by June 2018. Some people advocate starting charging from day one. We didn’t follow that practice — during beta our product was free to use. That decision had its advantages and disadvantages. This way we attracted more signups, but we also had users that weren’t ready to pay at all. Sometimes their feedback was distracting and demotivating. Next time I would start charging earlier. We rolled out the pricing very smoothly. At first, we put a notice about the trial that is going to be over with a link to pay. No teams were switched off or limited in features. Sales started to come. Later we implemented advanced notifications within Slack bot and in the web app. It resulted in more sales. No teams still weren’t switched off or limited in any way. This way, in six months we went from few hundred to $6k in MRR. Later we rolled out two additional pricing plans with more features. Some of them were delivered after we presented plans. Those features were marked “soon” so that customers kept informed. It worked really well. We started seeing purchases of new plans, thus increasing our average check. The next step was the most significant in terms of revenue growth. We deployed a system that was limiting our customers to what they purchased. Remember, by that time we didn’t have any limitations. Customers were choosing a plan and number of users but had no limits whatsoever. We were focusing on the product and not on the billing side of it. Once we rolled out the system, our sales and expansions skyrocketed. We were a bit worried about how customers would treat it. But it went smoothly. SaaS Pricing Strategy e-book by Pricing Intelligently was very useful to us during that process. Check it out here. Compare our MRR before and after. The system became fully operational in April. This way we learned that there is no need to be afraid to play by the rules with your customers. Sometimes being too nice can hurt your business. Play by the rules with your customers. Sometimes being too nice can hurt your business. As a startup, we have so much to do, but resources are very limited. Thus, we haven’t touched some areas that are on our radar. Customer Success is one of those areas. Even though our average check isn’t that high we believe in helping our customers understand a new way of managing a remote team will drastically improve engagement. These are two resources on Customer Success we’d like to implement: Customer Success: The Definitive Guide 2018 by Lincoln Murphy (he’s #1 person when you think of Customer Success) and 7 Lessons from 90 Days in Customer Success by Sujan Patel (who is really good at growth). Being profitable feels amazing. It means you will survive, while other 90% of startups around may not. That’s why I’m advocating reaching profitability as soon as possible to set the ground for your company (read — business). Unless you’re B2C, though. We set a short-term goal to reach $100k MRR which is a turning point for a SaaS that proves a real business potential. But, looking long term, I wonder whether a Slack bot is capable of getting to $1M MRR. Want to see how we’re getting there? Subscribe to our newsletter and follow our story. But, competition is getting stronger. Standuply has 20+ direct competitors on Slack. So if you’re considering building a Slack bot, don’t wait too long.